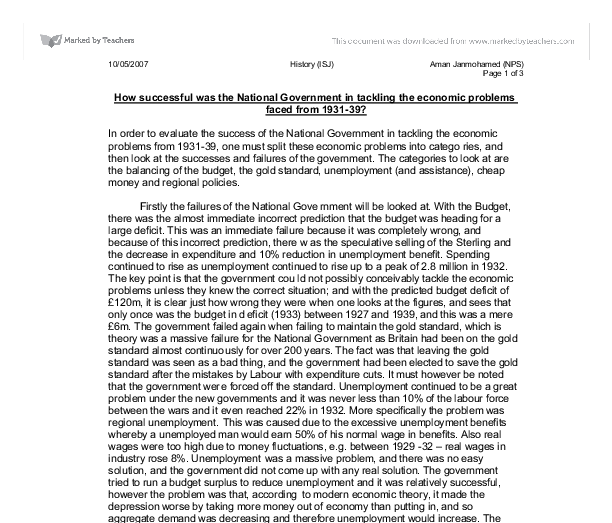 How successful was the National Government in tackling the economic problems faced from 1931-39? In order to evaluate the success of the National Government in tackling the economic problems from 1931-39, one must split these economic problems into categories, and then look at the successes and failures of the government. The categories to look at are the balancing of the budget, the gold standard, unemployment (and assistance), cheap money and regional policies. Firstly the failures of the National Government will be looked at. With the Budget, there was the almost immediate incorrect prediction that the budget was heading for a large deficit. This was an immediate failure because it was completely wrong, and because of this incorrect prediction, there was the speculative selling of the Sterling and the decrease in expenditure and 10% reduction in unemployment benefit. Spending continued to rise as unemployment continued to rise up to a peak of 2.8 million in 1932. 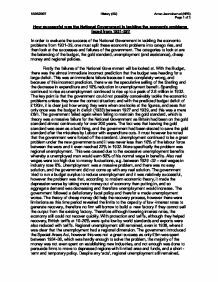 The key point is that the government could not possibly conceivably tackle the economic problems unless they knew the correct situation; and with the predicted budget deficit of �120m, it is clear just how wrong they were when one looks at the figures, and sees that only once was the budget in deficit (1933) between 1927 and 1939, and this was a mere �6m. ...read more. Secondly, the successes of the National Government must be looked at. The Budget was considered a failure, especially with the incorrect prediction, however the figures demonstrate that the government achieved its aim - the books had been balanced and the government was only in deficit once. Leaving the gold standard was seen as a great failure in theory for the government, however, ironically, it proved to be one of the government's greatest contributions to economic recovery. This was because a lower value for the sterling meant that exports increased and imports decreased, and so more production occurred and so unemployed decreased. Also it now became possible for Bank of England to reduce interest rates which in turn stimulated business investment. The government tried to run a budget surplus, as according to conventional economic opinion, this would supposedly have the effect of reassuring business confidence, encourage investment and recovery. This was in practise the wrong thing, but it was a success for the government as they achieved their aim and the budget was in surplus or equilibrium every year but one. Furthermore it used the policy of cheap money to keep interest rates low in order to encourage investment in new factories. This was relatively successful as it helped the recovery process and it contributed to the housing boom. ...read more. Furthermore regional unemployment remained in some areas. However in order to address the question, one must look at the role of the National Government in tackling the economic problems and thus the recovery. In general, the given view is that the government did not play a big role in the recovery. L.J. Williams, in Britain and the World Economy 1919-70, said, 'The general verdict must be that conscious government policy contributed little to recovery'. Some of the policies undertaken by the government were successful, such as the leaving of the gold standard, introduction of protection, cheap money, regional policy, and budgetary policy. However the consequences of leaving the gold standard were not what they had aimed to do, protection had a rather minimal effect on the recovery, cheap money did help however the links between interest rates and investment are weak, regional policy again had a minor effect and with the budgetary policy - this made the depression worse. Therefore while these policies may have helped overall, they are not enough to account for the economic recovery. A more important reason was the rise in real wages of those in work, meaning people had a higher amount of money to spend. This in turn stimulated the multiplier effect meaning aggregate demand shifted outwards, thus increasing employment. However this was only a short-term process and the underlying economic problems, such as unemployment, remained. 10/05/2007 History (ISJ) Aman Janmohamed (NPS) Page 1 of 3 ...read more. * The capital receipts (net) for 2004-2005 have been estimated at Rs 64439 million against the budget estimates of Rs 36677 million in 2003-2004. * The external receipts in 2004-2005 are estimated at Rs 156355 million. This shows an increase of 8.0% over the revised estimates for 2003-2004. Inflation can redistribute income and wealth between households, firms and the state. These costs are known as redistributional costs. Anyone on a fixed income, such as pensioners, will suffer most as the real value of their money would have been reduced. In fact, by 1934, the nominal effective sterling rate had risen significantly relative to the exchange rates of Britain's European competitors. Some argue that it was not the depreciation of sterling, however, but British trade policy, that was responsible for the trade-driven recovery. The confidence of big business had been lost. Hitler was therefore upcoming with a vision of a stronger Germany, which inspired confidence in big businesses who saw this as an opportunity to prosper again. This coincided with the danger of inflations, as there was increased demand and money supply. addition the minutes of each monthly meeting are available 6 weeks after. The Bank will also continue to be accountable to Court for its operations and finances. The Court comprises of people to represent the whole UK and are appointed for their expertise in their relative areas. circular flow of income will reduce demand-pull inflation at the cost of slower growth and unemployment. This can be undertaken by: - * A reduction in the amount the government sector borrows each year. * Lower Government spending. * Higher direct taxes (causing a fall in disposable income).